So what do you do if you run out of nori in the middle of making sushi? Well, after the initial “oh crud” moment, you find a way to replace it. Lucky for me, I have a TON of spring roll wrappers laying around, which turn out to be the perfect replacement for nori. Not only are they sturdy enough to roll sushi in without falling apart, they are also fairly bland, so they’re great for people who don’t like the taste of nori in the first place. 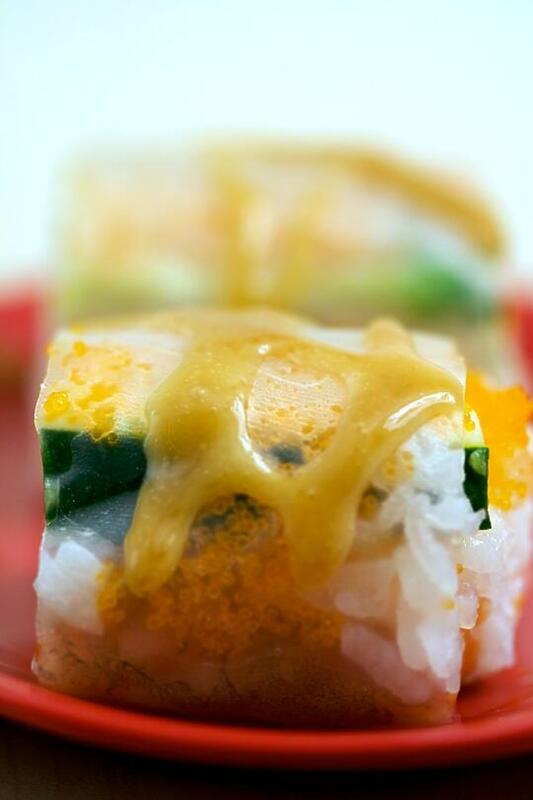 Since the name “sushi” refers to the seasoned rice that is used rather than the way the roll is made, these rolls that are reminiscent of spring rolls can still be considered sushi. But if you are making them at home, don’t feel like you have to eat them just like sushi. You’re free to skip slicing them into several pieces, and instead eat them with your hands and dip them into a sauce just like you might a spring roll. Oh, and before I give you the recipe, I must say something about the sauce. This sauce is amazing. Sure the combination sounds a little weird – not often would you mix mayonnaise, shoyu, Sriracha sauce, and brown sugar – but the result is sweet, salty, creamy, and just a little spicy. It’s seriously addictive – not only did we drench this roll with it, but we ended up dipping several other rolls in the sauce as well. Cut each cucumber stick in half. Remove the tails from the shrimp, discard or freeze for your own use. 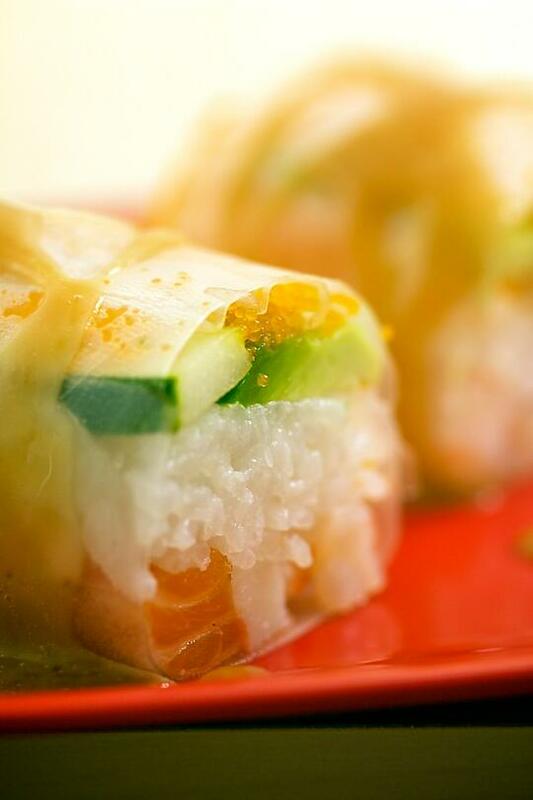 Slice the salmon into 1 cm square sticks, about half the diameter of the spring roll wrappers. Mix the mayonnaise, Sriracha sauce, shoyu, and brown sugar. Lay some salmon, imitation crab, and shrimp stacked in the middle of the wrapper, leaving about 2 inches uncovered on either end. Scoop about 1/3 cup sumeshi onto the seafood, patting it into an oblong shape with either end pointing towards the sides of the wrapper. Lay some cucumber, avocado,and tobiko on top of the sumeshi. Drizzle with the sweet sauce, and enjoy! Uh, my grocery store’s sushi line has carried these a long time. I find the spring roll a bit difficult to eat, to take a bit out of, a bit too chewy but the roll, rather like a California Roll sans rice, is excellent and very good for dieters as it contains no rice and is all veggie & crab blend. Wegmans Summer Roll 8 oz. 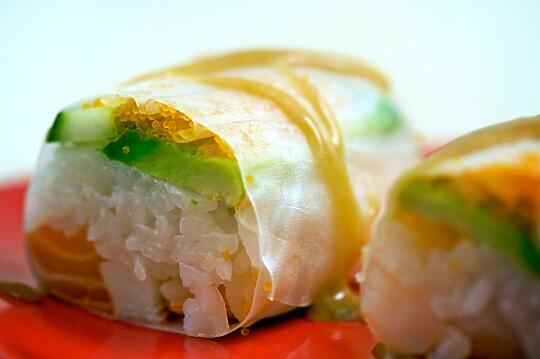 Product Details: Includes: Shrimp, avocado, carrots, cucumber, and lettuce rolled in rice paper. Ingredients: Imitation crab, shrimp, avocado, carrots, cucumber, & lettuce with dipping sauce. Using spring roll wrappers instead of nori? What a creative idea! They don’t get soggy in a few minutes like nori. Instead of nori, use very thin wide strips of daikon. Leave them in water for a while before using them to soften them. Or you could pickle them in sweet rice vinegar beforehand. Do the same with thin wide strips of cucumber. Dip them in lemon water for a while before using them! I think the sauce sounds delicious! Sue – Technically that would be a spring or summer roll, since without sumeshi it’s technically not sushi. But yes, I’m sure many places have similar types of rolls. Sliced into several pieces, they’re much easier to eat than trying to bite into a whole roll. Robert-Gilles – Those are both great ideas. I’ll have to try them out sometime. Thanks! noobcook – Thanks so much! Nicole – It is! You should definitely try it. Sounds delicious. My mouth is watering just thinking about it. For a get together, though, it would be better to mix in the rooster sauce components piece by piece to avoid adding stinky garlic. Garlic breath is bad… I try to avoid it when I am with my man. It can ruin everything. He’ll follow me around anyways though. Ground red pepper can substitute. I would taste it first and if it brings tears to my eyes then it’s too much. Love the innovative spring roll idea … it will enliven the platter next time I make sushi for my friends. Great post. Oh my goodness – I am in heaven! Our family’s favorite thing to do is cut up veggies and fish and make sushi. We are becoming better and better but always looking for better ideas! Your photos are stunningly beautiful! I am pouring over them as we speak (or type!). Thank you! AND…a few of our kids (we have 6 ranging from 15-27) won’t eat nigiri so the rice paper rolls are a GREAT idea! We may pull them into our fun now!